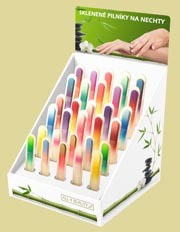 The glass nail file is an ideal tool for essential nail care; it does not matter if the nails are natural or synthetic. A chemical process using acid etching creates abrasive surfaces. Thanks to a special modification of this technology, is reached equally soft and coarse surfaces. In combination with the characteristics of the raw materials it provides outstanding features almost impossible to recreate in other types of nail files. We pay the highest attention to the quality and precision of manufacturing process. A major part of production is hand made in traditional ways and thanks to that we are able to run continuous quality control throughout the whole production process. Final quality controls guarantee the highest standard of quality for our products. We offer products, which share the finest of glazier and handcraft from a country, which prides itself on centuries of experience in traditional glass manufacturing. The idea to use glass for the production of nail files is over 50 years old and originally came from Switzerland, where it was first patented. The production process used now is based on totally different technologies and that’s why the current glass nail files are of the highest quality. For the production of our glass nail files we use the latest technologies hand in hand with traditional ways of glass manufacturing. Most of the production appliances were developed in our own research & development department. The raw material for the glass files is flat glass, so called float. Using acid etching during the production the glass becomes coarse. The coarseness is made directly in the structure of the raw material and it eliminates falling out of abrasive grains, which could happen to other types of nail files. The quality of abrasive surface ensures outstanding grinding ability even on relatively delicate surface. The typical shape of the nail file is reached by traditional hand grinding. The final operation is hardening by a method of ion exchange which ensures greater strength and prolongs the files lifetime. The majority of files are after this final step decorated in one of our many styles. Function - Regarding the fact that abrasive surface is made by coarseness within the body of the file, it is impossible to find release and fall of grinding grains. This phenomenon occurs when individual grains of abrasive material are fixed to the surface of paper or metal. This is excluded in case of glass file and stability of function without loss of grinding ability is ensured. Gentleness - With other types of files (especially metallic) we can often find brittleness and peeling of nails as result of their use. Regular use of glass file effectively prevents this unpleasant phenomenon unlike any other nail files and can dramatically improve condition of user nails. Hygiene - With regard to the materials used this kind of file is ideal concerning hygiene. It is not porous like e.g. paper file and this fact excludes the absorption of moisture with bacterial or mildew germs. It is possible to disinfect the file in the usual ways, to boil or sterilize in autoclaves; this is very important for professional use to avoid transmission of infection among customers. Firmness - Multiple increase of the firmness of basic material (glass) is achieved by hardening of glass-forming component by ion exchange. It ensures that the file does not crack by standard use. (Even non-harden glass endures normal agents affecting the file during nail treatment). The file can withstand being dropped on to common floor surfaces (carpet, linoleum...etc.). When dropped on to a hard surface (concrete, stone or ceramic pavement), it is possible that the file could get broken or damaged. Lifetime - When used normally (nail treatment), the lifetime of the file is thanks to features of basic material and its hardening practically boundless. Safety - Should the file break (i.e. due to an exaggerated bend or impact), the edges of the file are almost always blunt, diminishing the possibility of an injury. However files damaged in any way should be set aside to avoid potential injury. Versatility - Interesting point is versatility. Except for the treatment of nails it is possible to use the file to remove hardened skin around the nail and heel area. The best way is at first soften the skin by immersion in water and remove hardened skin with a proper tool, then finish with a glass file (the 195mm should be used for this purpose). It is also possible to use the file for the care of your pet’s claws. Another use is a gentle grinding tool on the edges of wooden or plastic material - handy for your hobby when producing variety of models. Glass file is not intended for materials harder than glass (metals etc. ).